Sunrooms are gaining in popularity here in Middle Tennessee, especially with the winters being as cold as they are. If you’re looking for sunrooms, we’ve got three options that our clients love: four-season sunrooms, three-season sunrooms, and single-pane sunrooms. Middle Tennessee’s cold winters mean that three-season and four-season sunrooms are our most popular picks. There’s one big difference between a four-season and a three-season sunroom— the four-season room has HVAC in it. There are many different factors to consider as you decide which sunroom would best suit your needs. What do we mean by “custom built?” Well, that means we’re not buying a kit and trying to force it to fit into your home. Instead, we custom measure everything. Then, we order it, the factory builds it and ships it to us, and then we build it onsite. We also custom build the window sizes. One of the advantages of a custom built sunroom is that we are able to design the room to fit the homeowner’s needs exactly. Because the sunrooms are considered to be a lifetime room, every part of them, including windows, glass, and everything else, is built to last. All of our components are warrantied. Most of the rooms are built with double-paned glass, which is another factor that makes it a four season room. Double-paned glass will help you keep your heating or cooling costs under control. Typically, the room is fitted with electric, including outlets, fans, and everything you might want inside of it. There are more affordable options available as well, primarily taking the form of a single-pane room. A single-pane room is just that — a room built with single-pane glass instead of double-pane. The walls will be a little bit thinner, but it’s the most economical package. If someone just wants a room to offer some coverage from the outside, a single-pane room would be the way to go. But most of the time, homeowners prefer a three-season or four-season room. One of the interesting features exclusive to our rooms is our retractable screens. 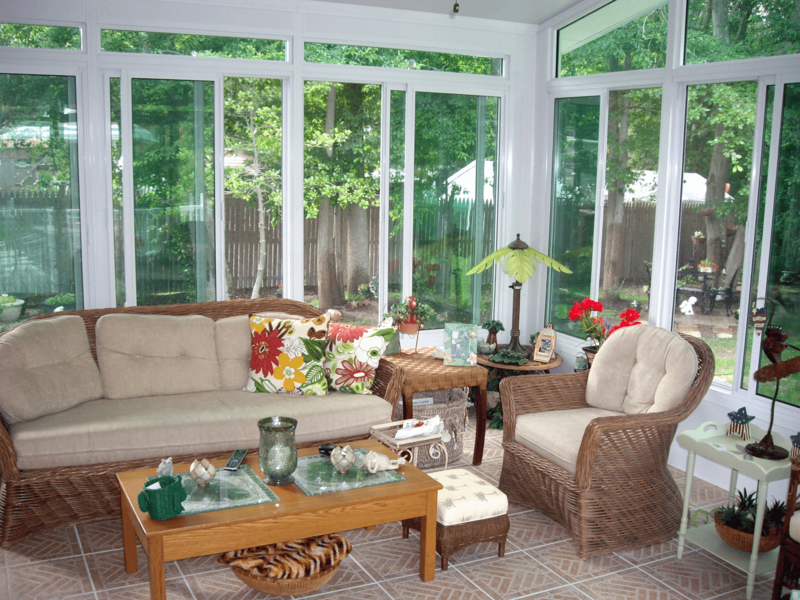 Typically, on a sunroom, you’ll find sliding glass and sliding screens. In general, upon receipt of the pieces of the room, we find that there’s some sliding screen damage; they’re very fragile. However, our screens actually retract inside the wall system itself, so it’ll retract down to a full screen and the homeowner can put it back up when they wish. That feature will give you more visibility inside the room when you’re not using the screens, as well as a longer lifespan for the screens. When you’re not using them in the winter months, you can easily put them up. They won’t be damaged by bugs, animals, the weather, and other potential dangers. The R value is the degree of insulating property that a material has. For a Four season sunroom, usually a three inch wall is what you need. Ours are generally going to be three inch or three and a quarter inch. With the three and four season sunrooms, we offer a lifetime room. There is a lifetime warranty on these rooms, which is very great. These rooms are built to last.